Everyone spends more time indoors during the winter months — and when you have kids, that often equates to a litany of “I’m bored”s. As seasonal snow and rain put a damper on the ability to run free outdoors, it’s time to create a winter haven in your home, filled with plenty of inspiring ways for kids to use their imagination and ingenuity. 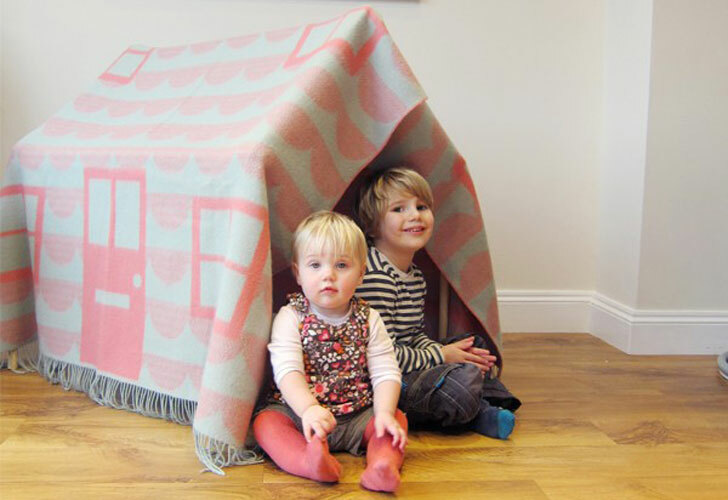 Donna Wilson’s House Throw Play Den Set enables tykes to fashion a fort in which to hold court in no time. You can also upcycle an old tablecloth into a sweet teepee that will surely be the backdrop for oodles of good times. If you have a tiny tot afoot, help her hone her fine motor skills with these 5 activities you can make together. Since most pint-sized kids love to be on kitchen duty, check out five of our favorite cookbooks for kids, and start training your tot to be a top chef. Is your drama king or queen into performance art? Here’s how to make a puppet theater from a recycled box. Of course, getting crafty is always a good time, and a great way to wile away an afternoon. Several captivating crafts include: making a recycled wind chime, making lead-free children’s jewelry, making a recycled parachute for LEGO mini figures, making a recycled pinwheel toy, making a fish tank for faux pets, making a dollhouse from an orange juice carton, and making your own pop-up book! And be sure to check out our stories, 7 eco-friendly winter boredom busters for kids and 7 eco-friendly winter arts and crafts activities for even more inspiration. Everyone spends more time indoors during the winter months -- and when you have kids, that often equates to a litany of "I'm bored"s. As seasonal snow and rain put a damper on the ability to run free outdoors, it's time to create a winter haven in your home, filled with plenty of inspiring ways for kids to use their imagination and ingenuity. Donna Wilson's House Throw Play Den Set enables tykes to fashion a fort in which to hold court in no time. You can also upcycle an old tablecloth into a sweet teepee that will surely be the backdrop for oodles of good times. If you have a tiny tot afoot, help her hone her fine motor skills with these 5 activities you can make together. Since most pint-sized kids love to be on kitchen duty, check out five of our favorite cookbooks for kids, and start training your tot to be a top chef. Is your drama king or queen into performance art? Here's how to make a puppet theater from a recycled box. Of course, getting crafty is always a good time, and a great way to wile away an afternoon. Several captivating crafts include: making a recycled wind chime, making lead-free children's jewelry, making a recycled parachute for LEGO mini figures, making a recycled pinwheel toy, making a fish tank for faux pets, making a dollhouse from an orange juice carton, and making your own pop-up book! And be sure to check out our stories, 7 eco-friendly winter boredom busters for kids and 7 eco-friendly winter arts and crafts activities for even more inspiration.